All our three phase transformers are designed to run well below maximum temperatures, allowing for high efficiency and minimal losses. 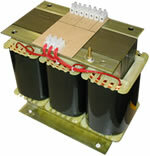 High quality copper, steel and insulation used on all transformers. These units convert three phase voltage allowing you to power imported equipment from Australian 3Ph 415V mains power. 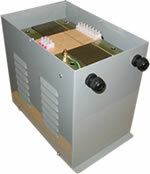 We custom manufacture three phase auto and isolation type transformers suitable for stepping up or stepping down any international voltages. An example would be a machine imported from China, three phase power in China is 380V, here ours is 415V. In this case a three phase step down transformer (415V - 380V) would be needed to run this machine. Before ordering a three phase transformer, first we need to determine the rating of your equipment. This will normally be marked on the back of the machine, on a rating plate, or in the instruction manual. It will be given as Amps (A) or Watts (W). Now, we multiply the Amps by the voltage and then by (square root of 3), ie. 220V x 10A x 1.732 = 3810VA (This is the most reliable method for calculating total input power). However, sometimes only the Watts are given, in this case we divide Watts by 0.85, ie. 5000 W / 0.85 = 5900VA approx. With the correct equipment rating in VA, you can confidently order a transformer to suit. 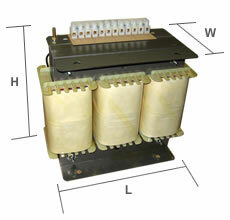 In most cases, a three phase transformer will be hard wired to the machine (ie. no plugs or sockets). Always get a qualified electrician to do the wiring.